The Duel TLSO is a unique prefabricated orthosis for post-operative, post-traumatic, or chronic spinal pathology. The DonJoy Duel TLSO is a unique prefabricated orthosis (patent pending) for post-operative, post-traumatic, or chronic spinal pathology. The Duel TLSO provides full-circumferential rigid support from the scapular thoracic region (T2/T3) of the spine down to the Sacroccygeal junction (S1). The TLSO design creates a 3-point force system, consisting of a posteriorly directed force from the sternal and pubic pads, and an anteriorly directed force from the thoracolumbar pad. The pressure created restricts forward flexion and encourages a hyperextension posture. This posture increases lumbar lordosis and resists lateral and rotary movements of the spine. Overnight and 2-3 Business Day orders must be received by 10:00 am PST/1:00 pm EST Monday - Friday to be shipped within 24 hours. my husband has ha several back surgeries and is now developing a hump as well as twisting of his torso. Will this help stop further worsening? The TLSO will help to keep his torso in a neutral position and help prevent him from bending forward. One of the strands has dislodged from the wheel pulley. Is there a way to get it back on? 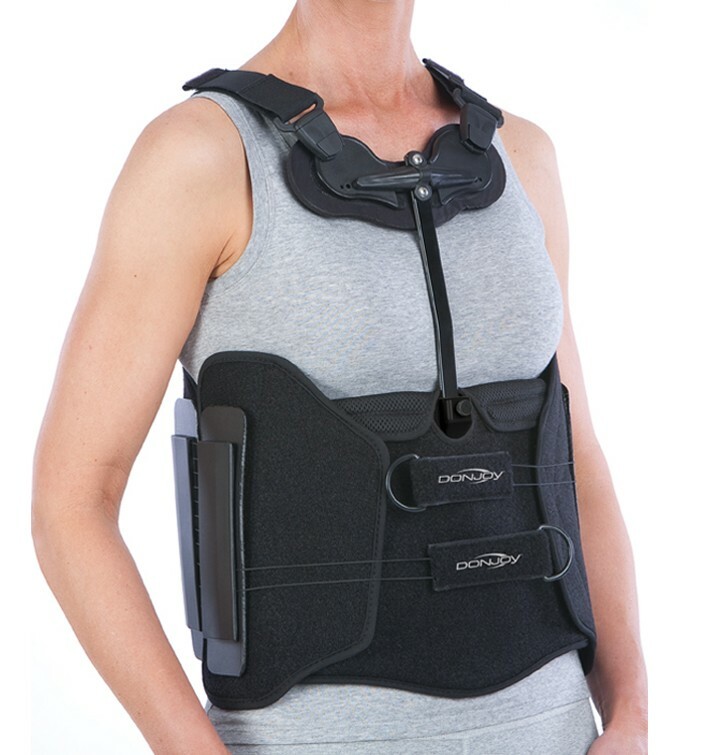 I know that some back braces require that you wear them only for a few hours due to the muscles becoming weak. Is that the case with this back brace as well? We recommend that you wear the product in conjunction with your doctor or therapist's treatment protocol. So if you are advised to participate in phyical therapy, the brace is not used as a crutch and the end all be all but as a portion of your total rehabilitation plan. Wear it according to your doctor's recommendation. We suggest wearing it during activities that otherwise without it would be painful. My questions my sounds silly but I have worked out in the heat and fear my back brace may have a sweat smell due to the prespiration during working in the yard and staining while wearing it. Can you tell me if there is a way to clean this brace after I have worn it to work in? The best way to clean the TLSO is to use a wash rag and luke warm soapy water and wipe it down. Then let air dry completely. You can also spray some febreeze on it too, if you'd like.